The 2014 edition of our annual Made in America issue, coming to newsstands soon, features the best regional products from the U.S. of A. Here, check out even more American-made finds, handpicked by the Dwell editors. The Linework system of shelves by New York-based studio Visibility elevates and frames objects that one chooses to fill spaces with. Zelda Table by Brooklyn-based designer Katy Skelton. 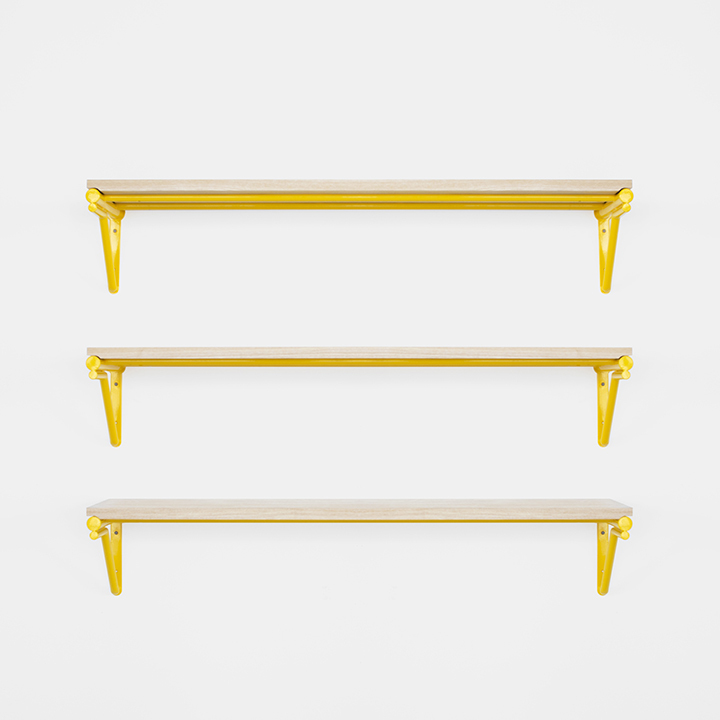 This refined industrial table is made of solid brass hairpin legs paired with an engineered concrete top. Grove Desk for Room & Board. Handcrafted by Pennsylvanian woodworkers, the Grove desk features a natural oil-and-wax finish that showcases the grain of its solid wood construction. Mid-century details like turned tapered legs and beveled edges lend an air of refinement. Toolbox by Loll Designs. This minimal toolbox is made of 100% recycled plastic material that doesn't rust and cleans easily. Its easy to grab, rust-proof handle makes it perfect for indoor and outdoor use. Los Angeles-based duo Scout Regalia dreamed up this wall hook made of heavy gauge powder-coated steel for durable everyday use. Seattle-based studio Ample's Hip Pocket table is a side table with a bonus: an elegantly integrated sling that gobbles up your magazines, tablet, e-reader, or whatever else is cluttering up your living room. The clean, simple lines of Indigo/Slate Dinnerware by Heath Ceramics, based in Sausalito, California, showcase the materials to their best advantage. These ice cream bowls by North Carolina's Haand are modeled after the shape of a crumpled paper bowl. The higher back walls of the bowl allow for easy scooping, while the front side can be used to drink ice cream once it’s melted. The elegant and minimalist Loft bed by Seattle-based Chadhaus has been paired down even further in a new version that comes without drawers on the underside. The Block bench by L.A. studio Sitskie is made of an interlocking block system that molds itself according to the sitter’s position. Each block in this handmade chair can be taken out and replaced without disrupting other blocks. This elegant bookend by Hunter Mack, made in California out of American-made steel, was inspired by the ribbon bookmarks sewn into book binding. North Carolina firm Skram Furniture Company has created a flexible and functional line of containers that can be utilized in various spaces, from offices to kitchens. The simple Continental Duffle bag by Minnesota-based J. W. Hulme is masterfully crafted using American leather selected from small tanneries. These Shape Mirrors by Brooklyn's Bower are made from a variety of tinted mirrors arranged to give the illusion of three dimensional shapes.